As most of you know we are in France and heading to Italy to meet up with the Australian Garden History Society. This is our ‘experience’ of a day cycling the Burgundy Canal out of Dijon. We couldn’t start our ride until 10am as that is when the Cycle Hire opens. However the bikes only cost €3 as they are part of the local bus company system. They were step through town bikes with 3 hub gears and a front basket. All very fine for a sealed flat ride. So, with a baguette for lunch we set off in fine weather, a few fluffy clouds in the distance. Thirty minutes down the trail thundery black clouds rolled in, with lightning flashing so we sought shelter for 2 hours in a ‘pub’ in a small village as the storm rolled around. Eventually the weather cleared enough for us to make a very hasty retreat back to Dijon. the storm still threatening, David said he had never seen me pedal so fast! Especially as a lady told us storms in this area were very dangerous. All went well until David had a puncture 1km from home, caused by a drawing pin! (Yes it happens here as well) So the ride turned into a walk as we had no way of fixing the tube. To finish the story, David had to pay €5 on returning the bike with a puncture! Nancy and David. Hope all are well. 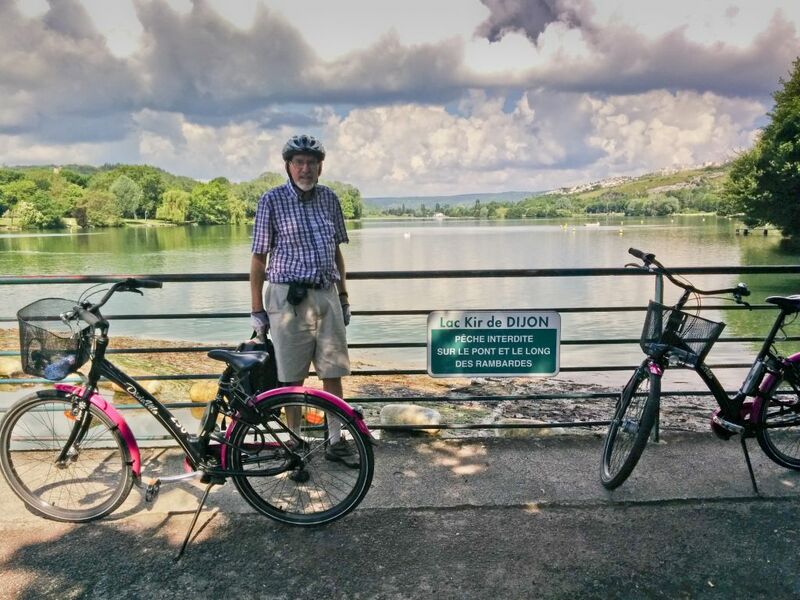 This entry was posted in Cycle touring and tagged Cycling in France by hlyth2013. Bookmark the permalink.